This Healthy Peanut Butter Fudge is just like regular fudge — super rich, uber decadent and tooth-achingly sweet — but it’s secretly healthy and guilt-free! Yup, that means no three sticks of butter, no four cups of sugar and no heavy splashes of corn syrup or heavy cream… just pure, fudgy peanut buttery goodness. Another good thing about this fudge is that it doesn’t have that annoying stick-to-the-roof-of-your-mouth kind of texture. Some people like that but I hate it. Oh goodness, this fudge is heaven. BIG taste, mini package. But it’s not as sinful as it looks and tastes. Not to mention, it’s SO. DARN. EASY. It’s made entirely in a food processor, which is fast, easy, and super convenient. Just dump all the ingredients inside, blend, and BAM… it’s all smooth and even. One BIG shocker here is that I was actually perfectly satisfied with just a few pieces of fudge… I didn’t feel totally out of control and like I wanted to plow through the entire pan. That’s probably because it’s full of filling protein and fiber, and doesn’t have any addictive sugar. Despite how freaking delicious it is, I was perfectly happy with just a few pieces at a time. 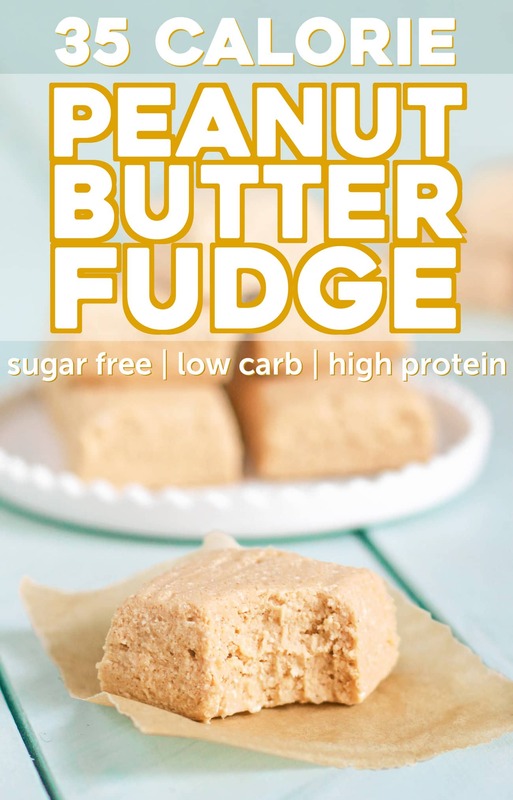 This Healthy Peanut Butter Fudge is just like regular fudge — rich, decadent, and sweet — but it’s secretly healthy with only 35 calories a piece and 1g of fat, plus 4.5g of protein! No need for the butter, sugar, or corn syrup! Line an 8×8” brownie pan with parchment paper both ways. In a food processor, add all of the ingredients. Blend until smooth. Scrape down the sides of the bowl if necessary. Scoop the mixture into the prepared pan and spread it out. Cover the pan with plastic wrap and refrigerate overnight. The next day, slice the fudge into 36 cubes. Serve immediately, or store in a tightly sealed container in the fridge for up to 5 days. 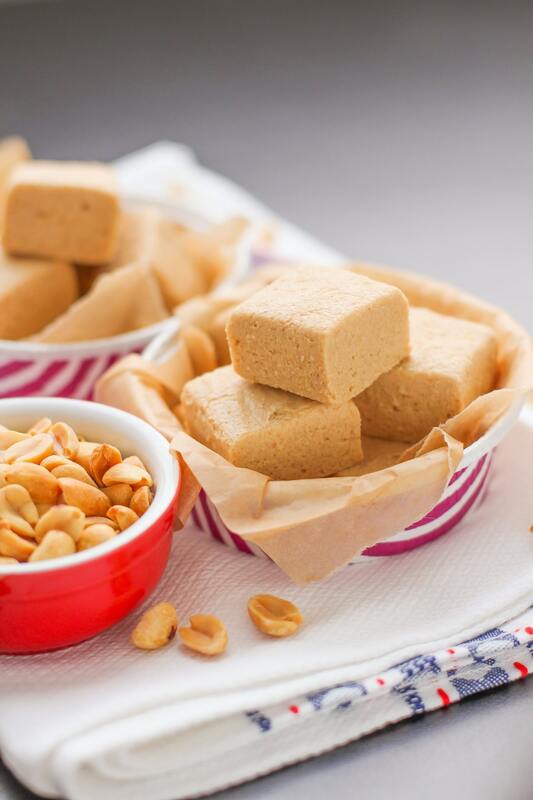 Watch how to make this Peanut Butter Fudge! can you use PB2 insted of peanut flour? is there a substitute for the psyllium fiber? I’ve never used PB2 so I can’t be sure. If you try it out, reduce the erythritol to 1+1/4 cups since PB2 has sugar in it. I truly wish I could provide ALL my recipes for free, but I’m really trying to shy away from advertisements as a main source of income (I feel like ads probably annoy the majority of people while a cookbook isn’t too bad, at just 39 cents per recipe…). I have future business plans for my life and wish to open up a healthy dessert bakery, which is impossible to do without some small form of revenue. I’ll explain this in a future post, but none of the money that Desserts With Benefits makes goes directly into my pocket. Hello Madame! You’re so creative! Can I substitute the homemade Metamucil with an equal amount of powdered psyllium husk…AND…can I substitute the cottage cheese with thick (goat, because I cannot have cow) yogurt? Thanks Sophie! Since my Homemade Metamucil is a mixture of psyllium and stevia, I would try using 2 tbs + 1 tsp of psyllium powder instead of 3 tbs. Hope you like the fudge!! I’ve been curious about getting a hand blender. Thank you for explaining it here in this post! Would you choose a hand blender over a stand mixer? It’s hard to compare hand blenders to stand mixers because they do really different things. The main question I would ask is, Have you ever wanted to try a recipe that required a hand blender/stand mixer but you couldn’t try it because you didn’t have one? And were you really bummed out about it? If you were, then I would look into buying one or the other. What exactly is Butter Extract and how does it work? What does psyllium husk do when incorporated in this recipe? Do you have to use HOMEMADE metamucil? Could I just use regular store bought stuff? This recipe is already out of my way as far as cooking goes… I was planning on bringing the chocolate dipped version of this to a potluck. Why does healthy have to be complicated! Just love the idea of healthy and delicious fudge. Just love peanut butter fudge. Can I substitute Stevia in the Raw (in the bakers bag)for the erythritol power. Thanks. Hope the substitution works out for you! I’m so grateful to have found your website 🙂 I have a lot of food allergies but since finding your site I have found some hope thanks for making me happy 🙂 can’t wait to try your recipes ! While I sure hope Greek yogurt would work here, I have a feeling that it won’t… cottage cheese has a lower water content so the fudge is able to solidify well. If you feel like recipe testing you can try out the Greek yogurt, but keep a few tablespoons of peanut flour and maybe another tablespoon of the Metamucil nearby in case you need it in the end. As long as the mixture is really thick, like pictured in step #5, you should be good to go! This recipe looks amazing! I plan on making it for my boyfriend’s birthday, who is obsessed with peanut butter! I was wondering, would it be okay to use store bought metamucil? I haven’t tried this recipe using storebought metamucil so I can’t be sure, but if you try it, just make sure to use the plain/unflavored version. Thank you so much for what I’m sure was lots of research (and licking the bowl) to come up with this recipe. Of course we all want to add our own variations. Since I don’t generally have psyllium husk in my kitchen, I’m going to use ground chia seeds and a little less than your recipe calls for since your homemade Metamucil has sweetener added to it. And the beauty of it is that even if it doesn’t turn out, it will still be worth it just to lick the bowl! Yeah, it took a few trial and errors to get the texture just right, but it was well worth it! I hope the substitution works out, and I hope you like the recipe!! Hi, just found your site and love it! Thank you for all these lovely recipes. Could I just ask if the Erythritol you use weighs like sugar or is it really fine powder like Splenda or canderel? I live in Ireland and Erythritol isn’t as easily available to buy. I was going to try recipe with truvia or Splenda until I get Erythritol on amazon. Thanks so much Fiona! The erythritol measures just like sugar. It’s a fine powder, just liked powdered sugar, and it weighs the same as sugar. I wouldn’t use Truvia since Truvia is 2x as sweet as sugar, and the fudge would turn out way too sweet… and I wouldn’t recommend Splenda since it doesn’t weigh the same and it might not work. I would wait until the erythritol arrives, just to be safe. I don’t want you to waste any of your ingredients on a failed batch (I’ve had WAY too many of those)! I don’t have erythritol, but I do have lots of other dry sweeteners. Would any of these work, and if so, how much would you use? …sugar (granulated, powdered, brown, and turbinado), sucanat, coconut sugar, date sugar, palm sugar, xylitol, Stevia in the Raw, and Splenda. Thanks! The sucanat and coconut sugar might make the fudge a really dark brown, so if that’s okay with you go ahead and use those. I would recommend using a blend of sucanat, coconut sugar, and Stevia in the Raw… let’s say 1/2 cup each? I hope these substitutions work out, and I hope you like the recipe!! Hi there! I’m so excited to find your website since I am super sensitive to sugar but still have a sweet tooth, and I always appreciate recipes that take good nutrition into consideration. I was really excited to try this recipe but broke the first rule of recipe-blog following — don’t make substitutions! I didn’t have any psyillium husks so I substituted ground chia seeds. The result is a peanutty-goo, that tastes good but certainly isn’t fudge. My bad. Oh well! I’ll try again and actually follow the recipe next time. Thank you so much for all of your hard work! I hope you get to try the recipe again and I hope you LOVE it!! Hi Jess! The good news is that the chia-seed concoction is edible — it’s sort of like a very tasty peanut butter. I’m using it as a mid-morning snack and a before-run snack. But I bought some psyllium husks yesterday and I’m looking forward to trying the recipe again. Happy experimenting! could i use greek yogurt instead of the cottage cheese, since you are just blending it anyways? I haven’t tried using Greek yogurt instead of cottage cheese here. It might work, but I’m not sure. 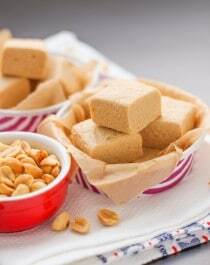 Cottage cheese has a lower water content than yogurt so you might need to add some extra peanut flour to help absorb any extra liquid, otherwise the fudge won’t firm up. i don’t have psyillium husks so i might try it with arrow root powder instead. i hope it works!! Tried this recipe and it is fabulous! Thank you! The texture is great and the cottage cheese gives it a nice tangy flavor. Thanks for your recipes! They are all great! Is there anything I can use instead of peanut flour? No store near me sells it. Gosh darn it, I have to make homemade cottage cheese again? Anyway to substitute for the homemade Metamucil without having to make an entire batch? Thanks! Line an 8 inch brownie pan with parchment paper both ways, set aside. Blend the cottage cheese, vanilla extract and butter extract until completely smooth. Add the erythritol and blend again. Pour the mixture into a stand mixer fitted with a beater attachment. Turn on low speed. Add the peanut flour and mix until it’s thick and fudgy, like cookie dough (it shouldn’t be sticky or goopy). Scoop the mixture into the prepared brownie pan and spread until smooth. It might take a while to spread, but try to flatten it out as best you can. Cover the pan with plastic wrap and refrigerate overnight. Slice the next day and serve! To store, seal tightly with plastic wrap and keep in the refrigerator. Thanks, Jess! Trust me, I would buy it if I could! I only make it at home because I’ve never seen it in the stores in South Korea anywhere. And I’ve got psyllium husk, just not the 24oz called for in the homemade Metamucil recipe. I was just trying to figure out how much I needed to use for just this fudge. I made this recipe and it was really good! I used a little less than two cups of cottage cheese and granulated erythritol instead of powdered. When I added the Metamucil it didn’t look as thick as I expected so I added another tbs and it got a little thicker after I blended it so I put it in my pan then. The fudge is really good, I would suggest making this to anyone who is wondering if it is worth making. My fudge has kind of a sandy texture ( I’m assuming because of the erythritol ) but I really like that texture, when I take it out of the pan it holds it’s shape but its a little floppy so I would actually add another tbs of Metamucil to this if I made it again. One more thing about this fudge – it tastes sooooo gooooood you want to eat the whole tray, but DO NOT try it! My mom liked it so much she ate four pieces of this and she felt so full after it she couldn’t eat anything for the rest of the night. And I are 3 the next day and was also uncomfortably full. Love the book and your recipes!! I don’t tolerate sugar alcohols or artificial sweeteners well so I’m limited to stevia or sugar. What would be the conversion for the erythritol if I would like to use a stevia liquid? For reference, I use SweetLeaf Stevia Clear drops. Do I need to up the psyllium since I’m adding a liquid? Thanks!! Since erythritol is a bulky dry sweetener like sugar, stevia usually doesn’t replace it well, since stevia is used on a much smaller scale as it’s so potent. In this particular recipe, the powdered erythritol would be best replaced with powdered sugar. I would start off by using 2/3 cup of powdered sugar, then give the mix a taste, and add more if you feel like it needs it. Hope you like the fudge!! Thanks Jessica for the video and I think that’s what many other food blogs are lacking. Videos make it incredibly easy to understand and follow recipes.